I figure I could take drawing requests, but I'm gonna go ahead and go by the same rule AS made for his thread: First request made gets drawn, and then after the drawing is posted the first request afterwards will be drawn. Neat. 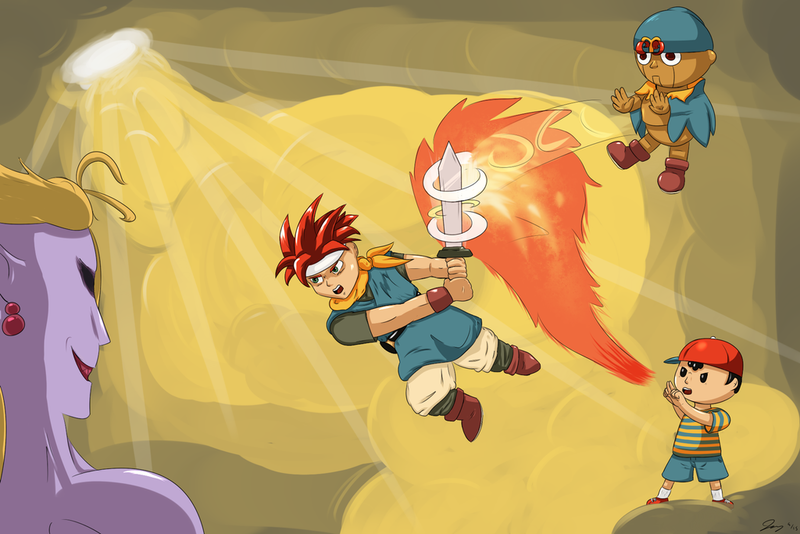 How about some kind of picture with Crono, Ness, and Geno? I'm not terribly picky, just want to see three characters from my favorite SNES RPGs together. Maybe them fighting someone, maybe Kefka, or just hanging out, I dunno. [USER=18119]@I REALLY HATE POKEMON! [/USER] This was fun to draw, particularly Chrono. It's fun to look at, too. That was a good idea to feature a Triple Tech between the three characters, very creative. It looks nice, thanks. I'd like a drawing of Luigi, please. I don't care what he's doing as long as he's portrayed in a positive light. I don't care what he's doing as long as he's portrayed in a negative light. ML's been in a bit of a trolling mood lately, I think, haha.